Friday 5th February, was “Polish Day” in Forfar. Soldiers from the 10th Mounted Rifles Regiment were visited all the schools and there were lessons about Poland. Youth organisations in the town were also visited. A commemorative plaque was unveiled in the location where in 1941 the King and Queen, and Gen. Sikorski took the parade march past of the Polish Army. The plaque was unveiled by Gen. Maczek. A delegation of 30 went from the 10th Mounted Rifles Regiment to participate. The ceremony was organised by the very successful branch of the Scottish-Polish Society in Forfar. In the town of Forfar in Angus there is a metal plaque commemorating the visit of King George VI and Queen Elizabeth, accompanied by General Sikorski to the town. The metal plaque is located on a wall in Market Street below the Sheriff Court building. It was here on the 7th March, 1941 that the Royal Couple, along with General Sikorski, took the salute in the march-past of the Polish troops. Another view of the march past of the Polish troops. The Royal Couple and General Sikorski can just be identified at the foot of the photograph. Forfar in the early part of the war was the base of a number of Polish units including the HQ 10th Armoured Cavalry Brigade under General Maczek. At this time the Polish Forces in Scotland's task was to guard the east coast of Scotland where they held the central sector. 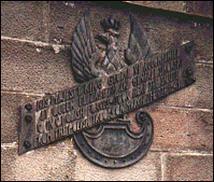 In the town there is also another plaque presented to the town by a Polish Army unit, the 10th Recce Unit which was based in Forfar.